This is the third in a series of articles about the family which I have published over recent months. Thomas, my gggrandfather, was born in 1806 and Ellen in 1808. I believe that she was the daughter of John Connor who rented land in Ballyduff between the holdings of Sylvester and his brother Bartholomew in 1825. They had seven children: in Ballyduff, Julia (b.1834), James (b.1836), Catherine (b.1839), John (b.1841), Thomas (b.1844, my ggrandfather), and Ellen (b.1847), and in Poplar, Mary Ann (b.1852). The stories of these children I will save for a later article only referring to them now as they affect their parents’ stories. Thomas had a smallholding in the east of Ballyduff from 1846, which he had given up by 1848. 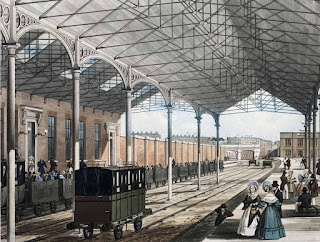 He was a farrier and as horses were the main mode of transport and haulage in the mid-19th century it makes sense that he would have gone to London where an awful lot of construction was taking place: railways, docks and sewers. 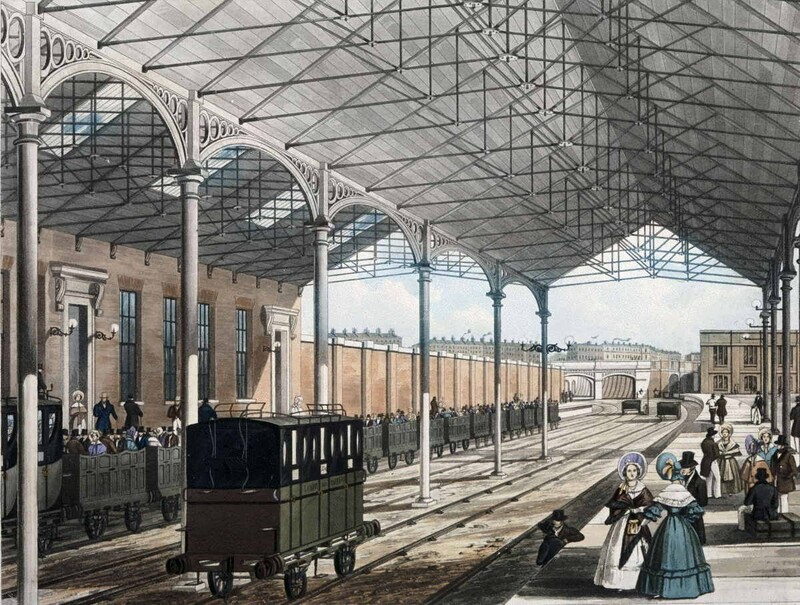 The fact the family settled in Poplar suggests the docks for Thomas. He is never described as anything other than a labourer in the census; it is on his son Thomas’s marriage certificate that farrier is shown. Ballyduff had two blacksmiths in Thomas’s time, one run by a Carroll family and the other by Paddy Connor, who may have been part of his wife’s family. If he was, that is where Thomas would have received his training. While migration to anywhere was a major upheaval, at least in relation to England it could be planned in a sensible way as long as you had the resources. Family members went ahead to reconnoitre the new territory. I have also been told that those in England stayed in touch and periodically travelled back to see the family in Ireland, resources permitting. Thomas and Ellen appear in Orchard Place, St Marylebone parish in 1851 in an area totally dominated by Irish including other Donoghues. Whether they were all related I cannot yet say (another project! ); some of the first names are not traditionally ours. The spelling variations are interesting but do not mean anything. They were all born in Ireland. 8 Orchard Place: John Donough (b.1816). 13 Orchard Place: Thomas and Ellen Donohoe, almost certainly my gggrandparents, with a lodger J.Connors (b.1834), who was probably Ellen’s nephew. There were forty-one people living in No.13. There was a No.13 ½ listed in this location as well with another sixteen residents. 17 Orchard Place: Margaret Donohue (b.1806), a widow, with five children: Denis, Catherine, Bridget, Mary and Michael, all born in Ireland. Margaret appears as a family name two generations later but I cannot be sure that she is one of ours. 18 Orchard Place: Thomas and Mary Donuhue (b.1811) with a son, Denis. Patrick and Jeremiah Conners (read them as Connors) are shown as lodgers; they might be more of Ellen’s family. 19 Orchard Place: Kate Donohoe (b.1802), a widow. 26 Orchard Place: Stephen Donahue (b.1830). But where were Thomas and Ellen’s children? I suspect they must still have been in Ireland, or somewhere else in England, waiting for their parents to fetch them. Eldest daughter Julia was 17 in 1851, so old enough to look after them, or perhaps they were staying with their grandmother in Ballyduff. On a later census (1901) Julia stated that her birthplace was Dublin – I suspect she may have thought she was answering the question ‘Where did you come from?’ I wonder if Dublin was where they took the boat to Liverpool and then travelled down to London by train. If they did, they would have travelled on the London & North Western Railway and arrived at Euston (see above right in mid-19th century). There were other potential family scouts in Poplar in 1851 at 5 Sophia Street (see map above): John Donohou (b.1820) and Honoria Donaghua (b.1835). As Thomas & Ellen were living in 3 Sophia Street in 1854 this became the chosen future home area and they were in nearby 28 Mary Street (became Rook Street) in 1861. Both of these streets have been described in earlier blogs. Thomas died in 1863 of typhoid fever and was buried at St Patricks, Leytonstone, which was opened in 1861. There was a pandemic from 1863 to 1868 and an epidemic in Britain from 1866-8 so he was unlucky to get it so early, but I wonder if his work in the docks exposed him to infection on boats from other parts of the world. Ellen went to live with her daughter, Julia, who had been married in 1854 to John Carrington. She died in 1889 and was buried with Thomas. Ellen was unable to read or write in English. Their children would have gone to the Wade Street School (two blocks east of Sophia Street, see above left for a photo I took in the 90s and Note 1), which was run by their local church, St Mary and St Joseph’s. 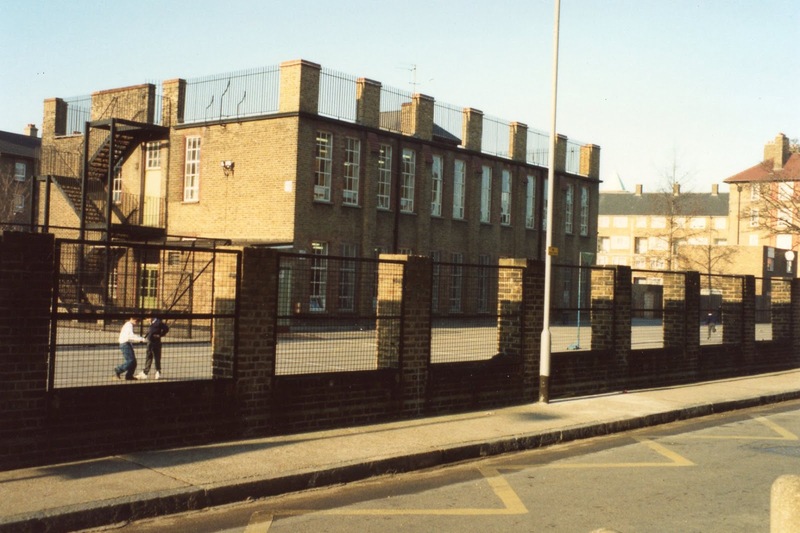 This was originally just a chapel attached to the school, but in 1855 a Kentish rag-stone building was completed in Canton Street (see right) to accommodate the growing Catholic community of which our family was clearly part. It was a very familiar place to the later generations. Mary and Thomas were married in 1839 in Ballyduff and had at least six children: Julia (b.1840), Michael (b1842), James (b.1846), Ellen and Thomas (b.1852) and a daughter, Mary, who was present at her mother’s death but for whom I have been unable to trace a baptism record. I have been lucky enough to be contacted by Gerard and Sean Ryle, descendants of Thomas’s father Michael, who have provided valuable information. Thomas is thought to have been the son of Michael Ryle and Julia Leahy, who lived initially in Ballinoebeg and later moved to Bishopscourt, very close to Ballyduff, where he is recorded as renting 24 acres in 1825. They are living right next door to John, my ggggrandfather’s brother, who was renting 14 acres. This is the current working hypothesis supported by the names they gave their children, but I have not found a birth or baptism record for a Thomas born to these parents. From 1848, Thomas was renting the house and garden next door to Julia, my ggggrandmother. By 1851, Mary is living just down the road from her mother in a house with an acre of land. Julia, by now well into her 80s, was no longer in her house in 1860/1 and the property appears to be split between Mary (house & garden) and her husband (house). Mary is still there at least until 1876, but Thomas has let his go by 1868/9. Perhaps he had died, Mary died in 1885. It seems that Mary, presumably helped by her sister Ellen in Ballincrossig, must have looked after her mother, Julia, for many years after Julia’s husband, James, died. Their son, Michael, moved to Poplar where he joined up with Patrick Donoghue and Ann Boyle as described in an earlier blog. They were married in 1839 and Joanna was from Sleveen close to Ballyduff. They had at least three children: Julia (b.1840), James (b.1843) and Mary (b.1845). John is such a common name that it is hard to track this couple down. If there is truth in the family story that an ancestor, called John, was shot by the British as part of a rebellion then it might be that this John was involved in the Young Irelanders revolt in 1848 and was killed. I have, however, found no record of this. The Poplar electoral registers from 1880 to 1885 show a John Donoghue at both 7 Market Street and 2 Upper Grove Street, Poplar, both addresses are very close to our family. Thomas’s widow Ellen was living with her daughter, Julia, at 14 Market Street in 1881 and at 49 Bygrove Street in 1886, so this does seem a good fit. Unfortunately I cannot find this John in the 1881 census. I have searched locally in north Kerry for the marriage of their daughter, Julia. While there is a couple in the right timeframe very near to Ballyduff, none of their children’s first names help the case. This couple has defeated me so far….but I will keep plugging away. …apart from an intense sense of gratitude and respect for what our ancestors endured to enable us to have our much more comfortable lives! Ballyduff was not as badly hit by the famine as some other adjacent areas but there was no future for people afterwards because the landlords had left and the work had gone with them. So our ancestors left – at least the male ones did. The Donoghue daughters married well and stayed…and looked after their mother. If any of our family died, it was most likely the children actually born in the famine years, who would have had the least resistance to the cholera that was rampant. Thomas and Ellen’s daughter, also Ellen (b.1847), was born in the worst year of the famine. Patrick and Anastasia’s Mary (b.1844) and James (b.1847) are similar cases. Society in Ballyduff and the surrounding townlands was very close-knit and people did not go far to find a spouse. As I have explained in an earlier blog many marriages were arranged by the couple’s parents. This closeness was carried to the places families went to outside of Ireland and lasted for at most two generations. Communications within the family and their spouses’ families, wherever they were, was actively maintained and home trips made, at least from England. Families sent out scouts to have a look for potential work and places to live in the target area. The conditions in which those who went to Poplar lived were awful, but I guess everything’s relative as it was not much fun in Ballyduff either. Proximity to water seems to have been a feature of all the Donoghue men’s destinations. On the whole the traditional Irish naming practice seems to have lasted no more than one generation. We almost certainly have many more family members in the UK and the States. 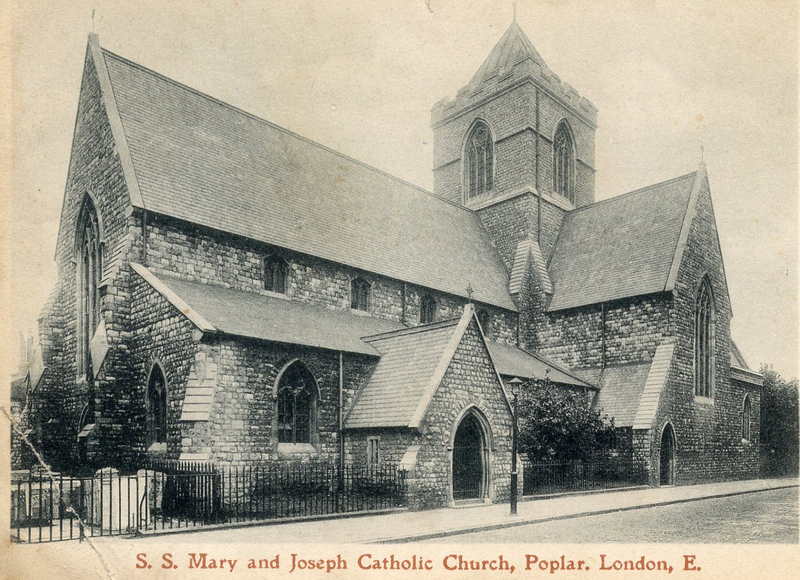 In 1729 the local Anglican clergy reported to their Bishop that there were “a number of Catholics living in Poplar, one of them, Owen Fitzgerald, lived in North Street (near the present Church) who was suspected of being a priest’. In 1816 there were enough Catholics in the area for a school to be built in Wade Street. Poplar was established as a Parish in 1818 and the first parish priest Fr. Benjamin Barber took lodgings in Hale Street. The first Baptism was recorded on 4th October 1818 and the first Marriage on October 10th the same year. By 1819 there was a small chapel and in 1835 a larger chapel connected to the school was opened. Originally the school comprised a chapel, house and school erected in Wade Street in 1818. Until 1908 it was known as the Wade Street School and from 1908 until 1983, SS Mary and Joseph's Roman Catholic School. The mid-nineteenth-century buildings were remodelled in 1905 and extended in 1922. A separate building was erected in 1929, bringing the capacity of the school up to 1,000 places for boys, girls and infants. The present buildings consist of the two-storey 1929 block, designed by Thomas H. B. Scott, with additional classrooms constructed in the mid–1970s.